It's time to report what veggies (or fruit) you are planting this weekend! I can't plant yet here - Zone 4 anyone? I am seeing a few tulips made it thru the snow we had last week, tho. San Marzano's are delicious sauce tomatoes. Get ready because those babies really produce! Patio Orange tomatoes, from seed. I'm a new gardner, practicing for the move to the homestead in a couple years. Wish me luck. I've had tomatoes, peppers, and zuchinni starts since the 1st of the month (California!) and started little lettuces, spinach, and carrots from seed at the same time. My caspian pink heirloom is three times its size at planting, but my cherokee purple hasn't even doubled. The caspian pink is flowering - I think it's even ahead of the more commercial hybrids (I was anxious to get things in the ground and had a hard time tracking down many heirlooms) like early girl and beefsteak. The zucchini leaves turned yellow last week, so I got some organic fertilizer this weekend and hope they'll pick up their color. The herb garden is off the hook! This is my first garden...fingers crossed. I've got brussel sprouts, broccli, sugar snap peas, 3 different salad greens, kale, eggplant, tomatos, onions...um I think that's it. I've got a bunch of tomatoes in the ground (Sungold, early girl, brandywine, and others) and just cleared out some enormous chard plants that had overwintered and put in some bush beans. Oh, and I've been busy squishing non-native garden snails. Escargot anyone? Whew, hope we can get it all done! 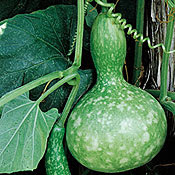 I put my bird house gourds in my compost pile. I don't know if they'll come up or not, but I thought it would look cute to have them draping over the side of the wire cage.